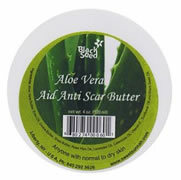 Aloe Vera Aid Anti Scar Butter, 6 oz. This ointment is intended to be used on scars and stretch marks but it also soothes inflamed skin and promotes tissue regeneration. Contains: Aloe Vera Butter, Emu Oil, Cocoa Butter, Shea butter, Rose Hips Oil, Lavender Oil, Calendula Oil, Vitamin E., Sunflower Oil, Black Seed Oil. 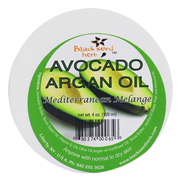 Avocado Argan Oil: Mediterranean Melange, 6 oz. This serendipitous blend of exotic oils is specific for skin pampering and epidermis lubrication. Green tea is powerful anti-aging anti-wrinkle addition that is rich in antioxidants. Argan oil is exclusive to the southwestern corner of Morocco where the oil is produced by cold pressing the seeds inside the nut of the fruit. It takes 100 kg of fruit to produce just 1 litre of this precious oil. Contains: Avocado butter, shea butter, argan oil, green tea extract, olive oil, black seed oil, vitamin E, and sunflower oil. 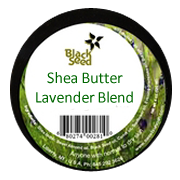 Black Seed Lavender Shea Butter, 6 oz. This relaxing blend of pure wildcrafted shea butter and essential oil of lavender will re-hydrate, heal and normalize skin growth and cell rejuvenation. The oils gently penetrate the skin and leave a lasting moisture barrier. 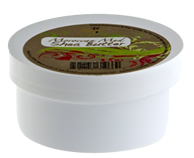 This butter is enjoyed by those with eczema, psoriasis, stretch marks, cuts and scrapes, skin blemishes, insect bites, chapped lips, cracked skin, skin fungus, dry itchy scalp and diaper rashes. Contains: Shea Butter, Coconut Oil, Sunflower Oil, Bees Wax, Black Seed Oil (Nigella Sativa), Carrot Oil, Almond Oil, Primrose Oil, Borage Oil and Lavender Oil. 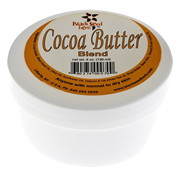 Cocoa Butter Blend, 6 oz. Contains: Cocoa butter, Shea butter, Sunflower oil, Black Seed oil, Chamomile extract. 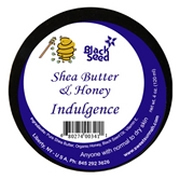 Vitamin E.
Honey Shea Butter Indulgence Cream, 6 oz. Shea Butter Indulgence Cream is formulated to protect dry and sensitive skin from the elements. It can also be used for stretch marks and blemishes. Contains: Pure shea butter, organic honey, black seed oil, essential oil fragrance blend, vitamin E.
Pomegranate Seed Fruit Nourishing Body Oil, 4 oz.. This blend of quality oils nourishes and refreshes the skin. It has antioxidant properties as well as natural vitamins and minerals. It can used on the face or massaged into stretch marks and wrinkles. Some people prefer to warm the oil a bit and use it instead of their normal massage oil. Others apply it after a bath or shower. 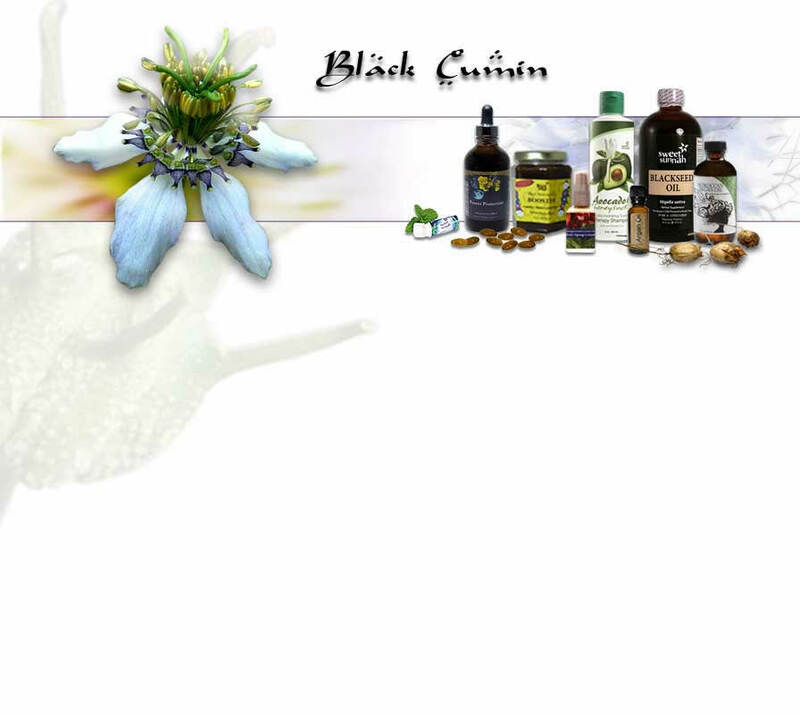 Contains: Black seed oil, Sweet Almond oil, Pomegranate oil, Jojoba oil, Sesame oil and Sunflower oil. Sore Muscle Jelly Hot Soothing & Relaxing, 4 oz. Using this gel gives sensations of both hot and cold. It can be used to relieve pain associated with arthritis as well as muscular strain, joint pain, and bruises. It is stimulating in a zesty kind of way and is not greasy. Contains: Aloe barbadensis (Organic Aloe) Juice, Limnanthes alba (Meadowfoam) Seed Oil, Menthol, Capsicum, Essential Oils*, Camphor, Kosher Vegetable Glycerin, Hamamelis virginiana (Witch Hazel) Distillate, Phenoxyethanol, Carbomer, TEA, Tetrasodium EDTA, Citric Acid & Black Seed oil *essentials oils = Peppermint, Basil, Black Pepper, Roman Chamomile, German Chamomile, Cinnamon, Citronella, Eucalyptus, Helichrysum, Ginger, Grapefruit, Juniper, Lemongrass, Pine, Ravensara, Rosemary, Spearmint, Oregano, and Black Seed Oil.